It was a fantastic show AND a great opportunity to see FRANKENSTEIN MEETS THE WOLFMAN on film, on the big screen! HALLOWEEN TREAT #4 - Jasper Anderson's Animated TOMBSTONES! The Cap'n received an e-mail the other day from young Jasper Anderson who has come up with something VERY cool! If you have a small video projector and a store bought or homemade tombstone, then you can have an ANIMATED TOMBSTONE! the animations - So you still have time to add that little "oomf" to your yard haunt! 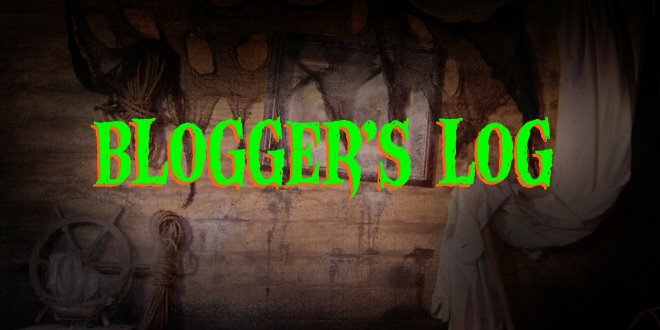 For more information check out his blog at: Mr. Chicken's Haunt and THANKS JASPER for sharing this! 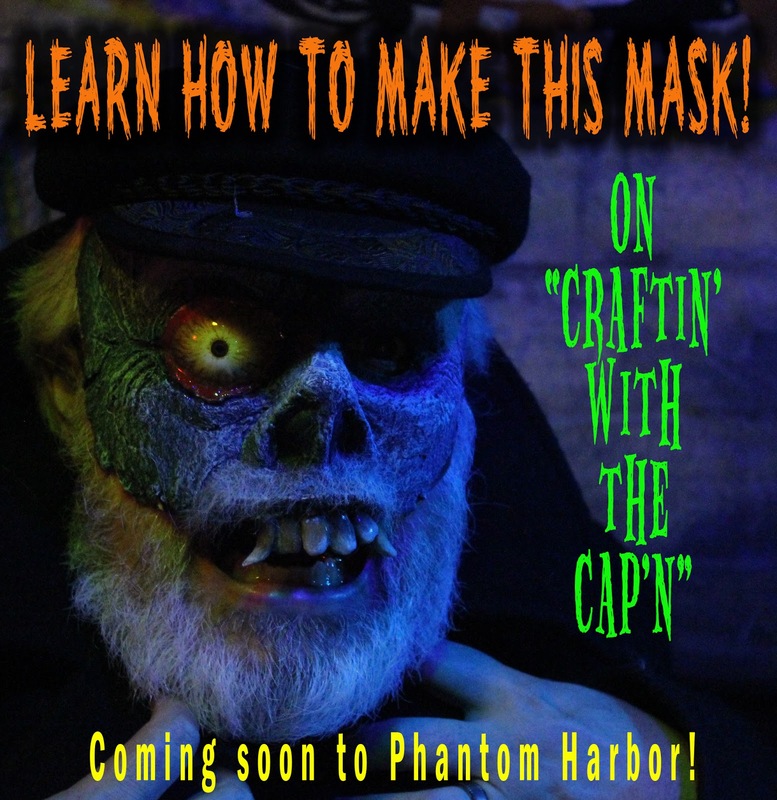 PHANTOM HARBOR: Craftin' with the Cap'n - Episode 1 from Shannon Shea on Vimeo. Grab some supplies and customize your own mask this weekend! 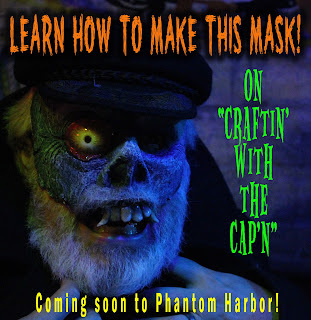 This evening we're all excited about a new feature here at the Harbor called: "Craftin' with the Cap'n" where our beloved Cap'n will demonstrate some spooky, creepy, creative crafts! First up: Papier Mache Masks! Now, don't be intimidated. With a little money, a little time, and a lot of imagination, you STILL have time to make a cool mask for this Halloween! So tune in this evening and check out the show. The lesson is long, but shorter than a Bob Ross episode! So what do you think the Captain found in his email today? Two NEW drawings by a young fan in Winter Garden, Florida. They were drawn EXPERTLY by one, Jessica Roddy, 10 years old! Check them out! Love the bolts, love the scars, but I love the expression on the mouth and the saggy eyelids! I don't know where to begin! 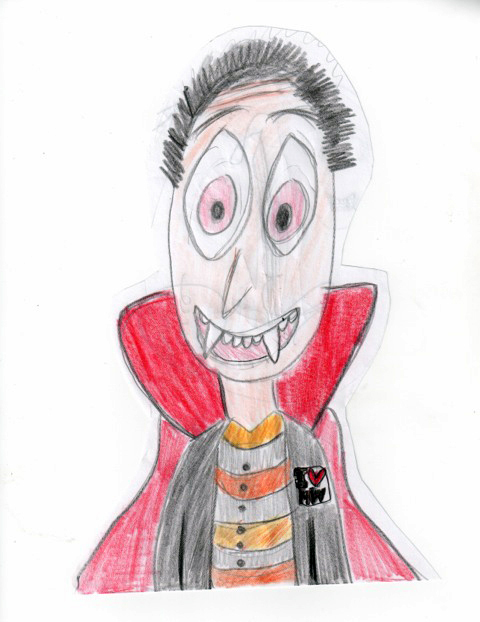 LOVE the striped shirt, the pink eyes, the lapel button, and the FANGS! Jessica's drawings will become part of the PHANTOM HARBOR GALLERY next month when the site gets updated again! We'd also like to extend special thanks to her parents for taking the time to send her art in and for raising such a wonderful talented young lady! The Captain sent Jessica a thank you email and encourages young artists, writers, and filmmakers to send MORE work to him. It's easier than falling off a log. Just write: TheCaptain@PhantomHarbor.com, embed the images or links, or attach them. We're all looking forward to seeing MORE! Since it is Halloween and we've been hoping that Haunters will emerge from their graves, crypts, haunted houses, lairs, etc. to share their projects, we decided we'd give this a kick-start. 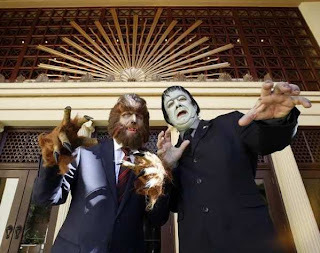 Years ago, while working at KNB EFX group, Brian Goerhing and Joe Giles began handing out DVD's to their co-workers of a Spook Show they had produced called "Spooky Time at the Wormwood Mortuary." Utilizing purposefully crude effects, costumes and puppets, they created an out-of-control world with their friends that upon viewing, was beyond hilarious. I must admit, that when I saw it, I went a bit crazy with enthusiasm! Even with the audio problems, I could not have enjoyed their show more! I literally begged to be on their show in some capacity, I loved it so much. What I discovered was that Spooky Time didn't have a "home" - it was a floating show. The guys just waiting until someone donated a space for them to shoot and then they would appear with their props, makeup and costumes and do the show. Had I had a bigger facility and if I hadn't been prepping for PHANTOM HARBOR, I probably would have suggested my garage. In any case, the boys produced a few more episodes, but were having difficulty getting all of their personnel and resources together. I suggested that they come to PHANTOM HARBOR as guests and they jumped at the chance. Brian and Joe said that they were happy that someone else would think of the situations and dialogue and then take care of all of the editing and post work. They would just be able to kick back and have fun. And did we have fun! The Spooky Time Guys visit PHANTOM HARBOR! They were so incredibly generous with their time - they brought their "Spooky Time Bat" which was puppeteered by the incredible Mike Deak (Mike Deak's YouTube Channel). Phantom Harbor Halloween Show from Shannon Shea on Vimeo. So we sat down with the creeps from Phantom Harbor to discuss what they would recommend for viewing this Halloween season! When asked what drove his selections, he said: "Anything with big, hulking, hairy creatures in it is good." "Normally, I don't go in for all that sort of dreck, but if I don't speak up, I'll be forced to have to suffer under the whims of someone with far less taste than me. So, since you're putting a hypothetical flintlock to my temple, I'll make some selections." 2.) The Portrait of Jenny - A ghost contacts an artist that leads them to a lighthouse on a stormy shore. 3.) The Four Skulls of Jonathan Drake - I don't know why this tale of voodoo and shrunken heads appeals to ME, but it does. For Halloween, the viewing choices are best when they include the biggest names in outstanding horror movie production juxtaposed with classic Halloween subject matter. So, first for Halloween we have GHOSTS! For my money nothing beats Christopher Lee and the Kensington gore of old Hammer Films. So, second we have VAMPIRES! Universal Monster's greatest creation! 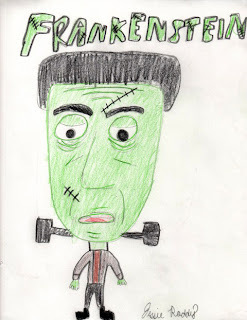 Frankenstein is nearly synonymous with the word "monster." 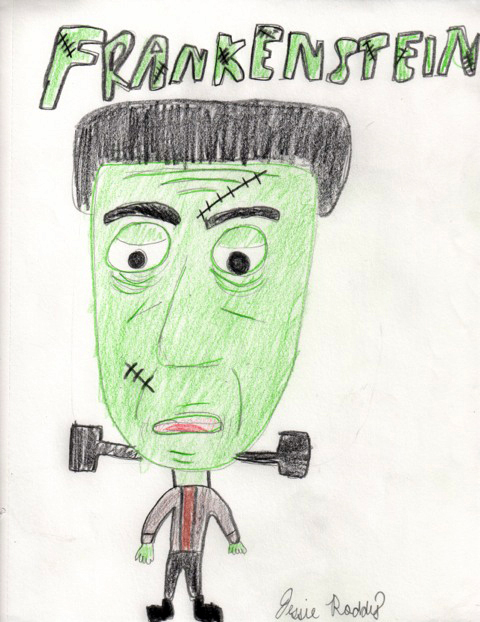 Third we have FRANKENSTEIN'S MONSTER as played by Boris Karloff, the best! This somewhat obscure British film concerns witchcraft and you really can't have Halloween without WITCHES! WITCHES, WARLOCKS, a SEANCE SCENE and a horrifying FIRE DEMON! Technically, THE HAUNTING could be considered a HAUNTED HOUSE movie, but producer WILLIAM CASTLE was a master at fun, thrilling movies and to me this could be the ultimate, classic, HAUNTED HOUSE film! Having Halloween without VINCENT PRICE and EDGAR ALLEN POE in a ROGER CORMAN film is like turning your lights out and not giving candy to trick-or-treaters. 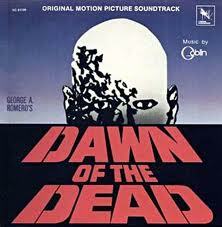 Really, the defining film concerning ZOMBIES. There would be no WALKING DEAD without this film. Frightening, gory, and full of social commentary. Colorful Horror, Italian style with a collection of short films that range from creepy to nightmare inducing. You can't have Halloween without an ANTHOLOGY. Director, Sam Raimi's masterpiece is a thrill ride and what would Halloween be without a story of DEMONIC POSSESSION? Okay, so for the next couple of weeks when you are stumped and looking for something to get under your skin, why not check out one of the films recommended by the Phantom Harbor spooks? Just wanted to let you know that over the coming days, expect to see some short features from your friends at Phantom Harbor for the Halloween season! In lieu of producing another lengthy Halloween special, the Captain and his pals will instead be posting smaller segments featuring subjects of interest all pertaining to the spookiest time of the year! Want to be included? Contact TheCaptain@phantomharbor.com, let him know what you are up to and he'll get in touch with you right away! Happy Halloween! Ahoy! Yes, it is that time of year when a frosty breeze slips through the air bringing with it the fragrance of autumn leaves and cinnamon! 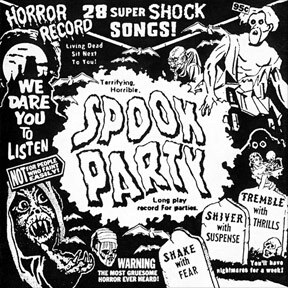 Halloween is nearly upon us and during this month, I like to listen to some of my favorite Halloween Records! 5. 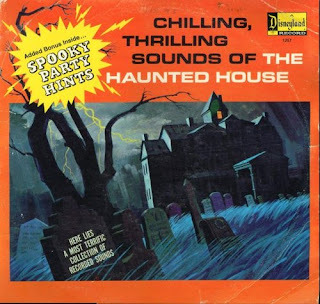 What would Halloween be without Disney's THRILLING CHILLING SOUNDS OF THE HAUNTED HOUSE? This album really shook the old Cap'n when he was a mere cabin boy! The screams and moans of the undead punctuated with thunder, wind and rain! Frightening! AND introduced by a weird narrator? Man? Woman? Who knows? 4. MONSTER MASH AND SOUNDS OF TERROR! This old record was the first time the old Cap'n heard Jack the Ripper stabbing a victim to death! The echo-y screams on it became the soundtrack to my youthful nightmares! The cover of the song "The Monster Mash" is fine, but once the tune is over, prepare for some real audio TERROR! The "Mall Music" alone is worth the listen! 1. 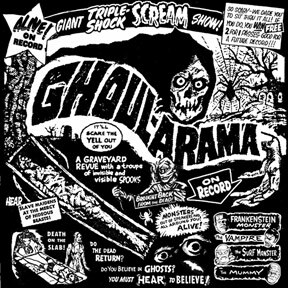 SPOOK PARTY - Like Ghoul-a-Rama, this collection of songs, sound effects, and surprises could put you into the Halloween mood on December the 25th! 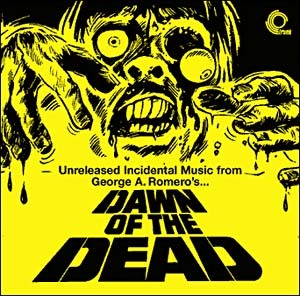 I can't count the times I've listened to this collection and have been transported to a dark world of ghosts and monsters! Oh wait! I'm already here! HONORABLE MENTIONS: Custom Collections sent to the Cap'n from two friends TRULY top the list. J.Michael Roddy's Halloween Collections that he sends out yearly are always an incredible Halloween Treat. As well as, the Haunting collections of former GHASTLY ONE member, Norman Cabrerra who is truly a Halloween Audio aficionado. Their collections play almost constantly around here all year long! Norman Cabrera working on HELLBOY! The man's got talent and LOVES Halloween! Put some spooky music on and get inspired! There you have it! Halloween Audio treats to get you into the spirit this season! Who knows, maybe one day someone will convince the Captain and crew to make their own Halloween Record?! No doubt you have watched the latest episode of Phantom Harbor...I've been belly-aching about it now for years so if you haven't, you owe it to yourself to see what all the grousing was about! Please...help support the show by watching it. I know most/all of you that read this blog do anyway, so THANKS! Here is the sculpture being roughed out. Refining shapes, clay stitching to get an idea of the final piece. SHANNON! Put on your GLASSES! I made a two piece Ultracal 30 mold (yes, I'm paying for that now) and cored it with aluminum-filled epoxy. At the time, I was working at KNB EFX and I believe Derek Krout ran the foam assisted by Patricia Urias (DAMN IT! FORGOT TO THANK THEM!). Laying up the clay wall to make the mold. A quick mold of the core was made with plaster bandage and I ran a thin fiberglass core. I had contacted Henson Studios animatronic expert and friend John Criswell to ask if he could do some rudimentary mechanics. He said he would use some left over bits and pieces and do what he could. Meanwhile, I seamed and painted the hero skin. When John returned with the mechanics he had OUT DONE himself! Utilizing three old servo motors and an old, banged up radio transmitter, John had given life to the puppet. A two axis jaw mechanism (which means it moves up and down as well as side-to-side), and little eyelids to strain uncomfortably against the stitches! He glued the hero skin down onto the mechanism and returned it to me so I could do the hair work. During the painting process, I'd bring the skin to the set and check it in the stylized lighting to make sure that it read. I bought an old gray wig from a costume store, cut a small section of the wig at the crown, glued it onto Cap'n Keller's scalp and punched the rest of the hair around the hair line. Then he was finished off by gluing stitches (rather than sewing through the skin) onto the lips and lids and then fired him up! 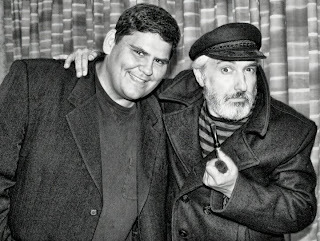 Casting the character of Cap'n Keller was a long process. Originally, I had pegged long-time friend and performer Alec Gillis (co-founder of ADI Studios) to play Keller's voice. I had always imagined Keller having a James Mason-esque quality. 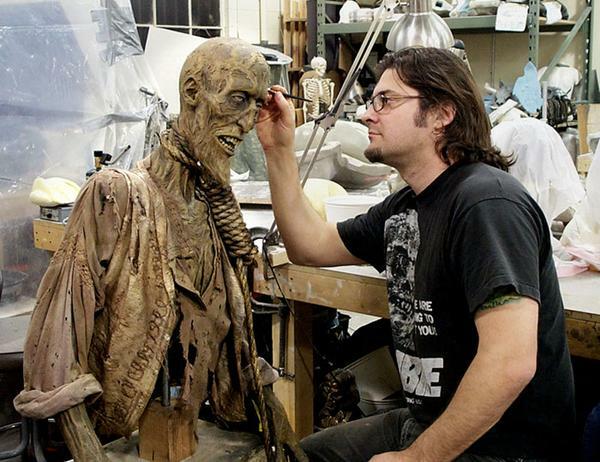 But as the months wore on and schedules shifted, I approached Emmy-Award winning prosthetic make-up artist and composer of the Phantom Harbor theme, Andy Schoneberg to play Keller. Andy has a naturally resonant voice (go watch Mike Deak's short films on youtube - somemannerof channel and you'll hear what I mean). But alas, shifts in schedules etc. prevented this collaboration as well. The night of the shooting, I had asked my daughter, Molly to come to the house and puppeteer. During the evening, she was doing a very good imitation of James Mason. So good that our director, Tracy Shea, suggested to figure out a way to use Molly's performance. That is when Cap'n Keller REALLY came into his own. I re-recorded Molly reading Keller's lines and in the editing program, re-pitched her voice lower and added a slight reverb to it. A star was born! Like the show, Keller was A LOT of work all on his own and through a series of misadventures and unexpected twists, what we finally got was so much better than we anticipated. Keller in an early lighting test. Now that this is done, I can loosen my belt a little, slow down, and really look around and appreciate how this all came to be. During the shoot of the film PREDATORS in Austin, Texas, my long-time friend and colleague, Gino Crognale, suggested that I shoot as much footage at that location for PHANTOM HARBOR for no other reason than it got the character off of the set and into an exotic location. The Art Department on PREDATORS led by Steve Joyner and Caylah Eddleblutte had built what was an impressive exotic jungle set and with their permission, we grabbed my little Hi-8 videotape camera (yes, before digital!) and we began to shoot with no story in mind. I knew, however, two things: Exotic jungles need headhunters and there was no way I was going to be able to hire a bunch of actors to portray headhunters for my humble show. The idea of making puppets hit me and soon the concept of a Geckoniki had been born. Truthfully, it was such a seat-of-the-pants idea that in unused footage, the Captain keeps mispronouncing the word! I asked Robert Rodriguez if we could shoot some elements on his massive green screen stage and I'll never forget his question: "How big will your crew be?" My answer: "Just Gino and me." "Oh, " he responded, "Go ahead then." So one Sunday Gino, Dave Wogh (who had been making props on location for Phantom Harbor with little more than rubber bands, tape, and whatever he could find) went onto the green screen stage to shoot. As luck would have it, one of Robert's trusted collaborators, cinematographer Jimmy Lindsey, was there, knew us from our past work, and offered a couple of Kino Flo lights to light the stage! Shooting could commence. At the end of the day, we had all sorts of footage including the Captain in a boat that had been lent by the Art Department along with a fishing pole. Elements were coming together, but not a clear story. One night, I cooked up this story about a missing sea Captain, Captain Keller, and that at least gave us a template for shooting when we left Troublemaker Studios and headed for the forests of Austin. Again, with no rhyme or reason we began shooting the Captain darting through trees, calling for Captain Keller, etc. and I kept thinking: "How the heck am I going to put all of this together?" The show wrapped and Gino went back to Pennsylvania while Dave and I returned to Los Angeles. I had so much footage to now sift through, and a script I had typed and printed in Austin to sort of go by in assembling the episode. I was able to cut together what I considered Part 1 of the episode entitled "A Cry from Captain Keller" and posted it on Vimeo in 2010. I was so full of optimistic energy that I was SURE I could complete part 2 in a matter of weeks. I gave myself 2 months and started building. I had no idea. During this time, www.phantomharbor.com was getting "Birthday Requests" (which I thought was a great idea to increase awareness of the site and show) so The Captain was making appearances there and in a couple of Halloween Specials (that I so love doing...again, we'll have to wait for 2013 for a BIG special!) but I always felt that the Captain really was still on Geckoniki island. If you've been following the blogs, then you know how much I had to accomplish just to create part 2. Geckoniki puppets (rod and hand versions), Captain Keller, miniatures, props,sets and then shooting, shooting, shooting...What am I saying? Then, EDITING, EDITING, EDITING! My original intention was just to pick up the action on Geckoniki Island as soon as The Captain had hit shore, but in thinking about it, that would mean that Captain Keller would not be introduced until the end of the show and he is such a great character, I didn't want to waste him as a "boo" at the end of the show. I realized I could do a rewrite, make the entire episode basically a flashback, and feature Captain Keller throughout the entire thing. This meant that some footage I shot would become redundant and unusable while new footage would be needed to pin the entire story together. Trust me, it's no way to make a movie. So now it is done. You've been with me on this voyage for nearly TWO YEARS! And, yes, I'll be resting for a bit. A BIT! But we're coming back soon with more fun! Thanks again for your patience and support. I really, really could not do this without you all! P.S. - What are you standing around reading this for? Go watch the episode! Not much more to say. Slow rendering. Hope to post soon! 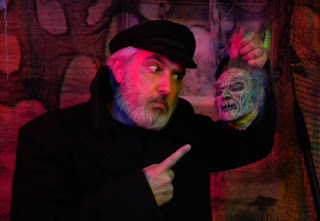 Yes, you've heard very little from the creepy shores of Phantom Harbor recently and that's because yours truly has been up to his ears in post production. I'm sure I sound like the boy who cried 'Wolf" but trust me when I say that any day now "The Rescue from Geckoniki Island" will be posted. A little over a week ago (it seems like an eternity, trust me), friend and performer Mark McCracken joined Mark Tavares and me for a Geckoniki/Goblin/Corpse puppeteering marathon! It was a fantastic shoot and within a day, the Geckonikis began being cut into the movie. I had hoped to arrange for Alec Gillis (co-founder of ADI and "Hotel Superman" star) to play the voice of Captain Keller. I had also offered the role to Phantom Harbor theme composer Andy Schoneberg but my schedule and their schedules were out of sync. On the night we shot the puppet, my daughter, Molly Shea performed Capt. Keller and so, based on her brilliant performance, I recorded her voice and altered it in post to play the cranky, James Mason-esque character. So, dropping in sound effects, cutting scenes, finishing credit rolls, and hoping to get this posted soon. You've all been so patient; I thank you!